Are you ready to play a slot machine for real money that is like the alien invaders Atari video game? 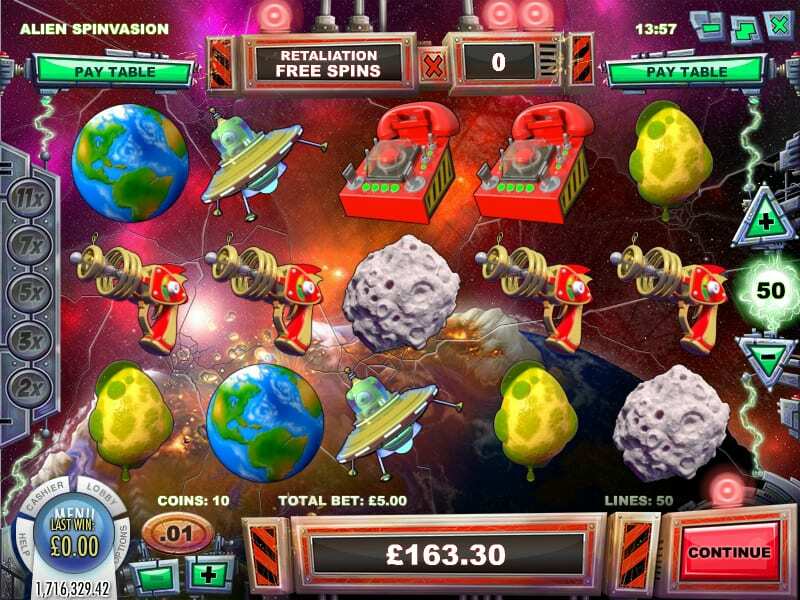 The Alien Spinvasion slot machine game features five reels with 50 pay lines. Rival Gaming software powers this three-dimensional alien theme slot machine that can be played online with or without a download in an instant. This mobile casino slot game can also be played using your mobile Smartphone and tablets. This game is your opportunity to save the human race from the aliens that are invading. You can save the human race by opening up your slot machine and spin the reels gaining some extra money in your pocket. This game does not feature a progressive jackpot however it does have some pretty good features. It comes with a sticky wild symbol; a Robinhood Free Spin Round as well as During Free Spins all icons become Drop Icons. Feel free to view the Full List Of Rival Casino Slot Machine Games. 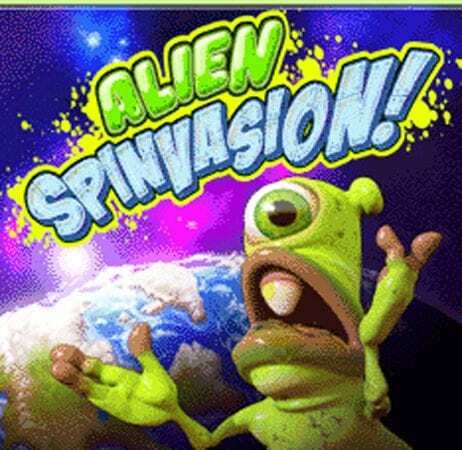 Rival casino gaming software released the ‘Alien Spinvasion’ slot machine game in March 2017 right after they released Dollars To Donuts slots in February 2017. Rival gaming has come a long way with their graphics, gameplay, sounds and overall ways to win cash instantly. You will be retaliating against alien spacecraft with the help of the Army General. The symbols that you will see the real are indicative of the alien outer space theme. You will see some traditional poker playing card symbols such as the King, the Jack, the Queen, the ace, the nine as well as the ten playing cards. The other symbols you will see on the wheels when playing Alien Spinvasion Internet slots with real money are the planet Earth, a Meteor on a collision course, a speeding rocket, a deadly Ray gun plus an Alien Egg that’s ready to hatch. When you are spinning the wheels playing Alien Spinvasion Internet slots with real money at one of our recommended casinos that are listed on this review page keep your eye out for the alien icon as that is the sticky wild symbol. The alien sticky wild symbol will replace all of the other symbols to help you form a winning combination. He will also stick to the reels, so you do not lose the chance to put together a wild symbol combination. The other symbol that you should watch out for is the Army general. When the Army general appears on the screen, he triggers a free spins bonus game. During this free spin bonus game, all of the symbols become drop icons.